First, if you haven’t yet donated via our Thundafund appeal, please do so. We value your presence in our network more than your money, but we do need to fund this effort if we’re to make this work sustainable. As ever, if you haven’t yet filled in our Support form, please do so. If you’re associated with UCT, please sign that petition. And if you’d like to start a campaign at another university, please get in touch. Now, on to some reports from our various launches, and some other news. Meanwhile, later this week, via a protest with 350 Africa outside Nedbank (yes, the ‘green bank’) over their coal funding, we’ll be in Howick (by invitation!) and Durban (tell your friends). 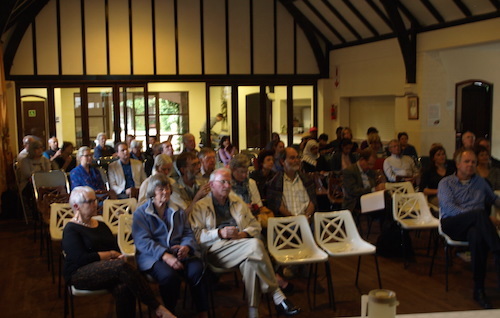 Our Pretoria event was at St Mark’s Church, Waverley, with guest speaker Simon Gear, former 50|50 anchor presenter and author. At every event – Cape Town, Bloem, Joburg, Pretoria – we have been moved by people’s enthusiasm. The divestment campaign somehow excites people. Why? Is it because of the link to apartheid? That it is a bit edgy? That we are taking on the dirty fossil fuel industry on their own terms (money)? That it is rapidly growing globally? That it is supported by amazing moral leaders such as Archbishop Tutu? All of the above? Irrespective, it is a wonderful thing to grow a movement amidst such palpable enthusiasm and support. 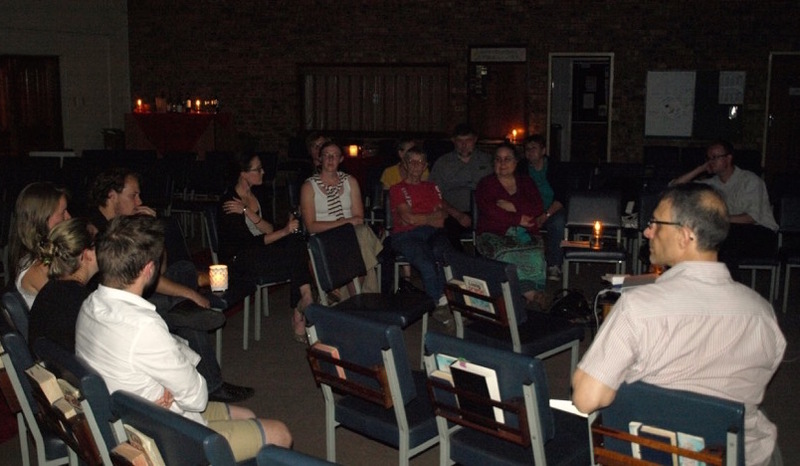 Each event differs and our venue this time was without electricity, but using oil lamps and a series of extension cables from a kindly neighbour for the projector, we got going with gusto in low-carbon mode. Simon Gear, our guest speaker, kicked off the evening explaining that “everything scientists say we should do to combat climate change, we should be doing anyway”. For example, shutting down coal mining and coal-fired power stations would also have massive benefits for human health, water quality and quantity, and biodiversity. He emphasised that these reasons alone – climate change aside – would justify a rapid switch to clean energy. And of course using renewable energy creates more, safer jobs. 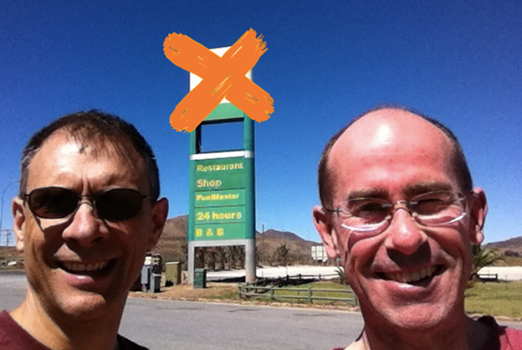 Simon expressed his excitement about the global divestment campaign and it being an effective lever for real change. In response to a question about the impact of wind farms on bird life, he pointed out that wind developers are now well aware of the good and bad locations for wind farms, and noted that no energy technology is impact neutral (Simon has done work with BirdLife SA to assist with these issues). And of course the impacts of renewable energy technologies are far lower than those of fossil fuel energy generation. Simon mentioned that renewable energy just makes good financial sense and David Le Page later pointed out that new SA wind power is already 30% cheaper than new coal-fired supply. It then has to be asked: Why are we planning more coal-fired power stations, that are more costly, take longer to build, create fewer, more dangerous jobs and are so polluting? Following the speakers, our group of 15 started a lively discussion and many good points were raised, including how banks need to be encouraged to shift from funding fossil fuel to funding clean energy infrastructure and that SA in the past six years has commissioned almost 4GW of clean energy (about 10% of its power supply), of which about 500MW are already producing power and that there is massive further potential. No more dirty coal (or gas)! We eventually had to cut the group debate short, but discussions continued for almost another hour over many glasses of wine. It was also exciting to see a number of students and staff from two of Pretoria’s three universities. Let’s hope divestment campaigns get initiated at all of them soon. Huge thanks to Rev. Glynis Goyns of St Mark’s and SAFCEI for her tremendous support in hosting this event. What an evening!!! There were one or two sceptical voices, but the positive energy was palpable. Thank you to all speakers and attendees. We eventually had to cut short the questions and we thank all participants for the level of interest and enthusiasm shown. Thanks again to Spier, which has a long and proactive tradition of social and environmental stewardship, for sponsored wine. In his keynote speech, former water affairs and forestry minister and anti-apartheid stalwart Ronnie Kasrils outlined the effectiveness of the anti-apartheid boycotts, sanctions and divestment, and spoke strongly in support of the Fossil Free divestment campaign. He also said ‘This is my maiden speech on a green platform.’ We were delighted to have provided it! Of course climate change is much more than ‘just an environmental’ issue – it is moral, economic, social, current and intergenerational equity – which is why it is wonderful to have a strong moral leader like Kasrils support and endorse this campaign. His passionate speech left no doubt as to our course of action. Our context is different to the apartheid milieu, but we are needing to shift mindsets fast, and divestment is a powerful tool for doing so. Makoma Lekalakala of Earthlife Africa described in a moving and vivid talk the health and environmental impacts of coal mining and coal-fired power stations on surrounding community members and how promises of job creation are regularly proved empty. The facts are clear: you would not want to live anywhere near a coal-fired power station. Earthlife Africa is one of the organisations that endorses the Fossil Free SA campaign. 350 Africa’s Ferrial Adams, a close collaborator and team member, described the fascinatingly rapid global growth of the Fossil Free campaign. She also outlined the research that 350 is doing into involvement of private banks in coal, particularly following the world bank’s commitment to no longer fund this sector. In respect of the fossil fuel industry’s political influence, she also reminded us about the ANC’s investment in Shell via a trust with holdings in Thebe Investment. David Le Page followed Ferrial with his presentation arguing the cases for renewable energy and coal, oil and gas divestment, which was followed by Robert Zipplies talking about the team behind Fossil Free SA and what attendees could do to get involved and support this global movement. Bloemfontein you ask, what happens there? Well, let us tell you: Lots! We had a small, but very inspiring meeting with Prof Doreen Atkinson and Dr Ruth Massey and a number of other academics from the University of the Free State. We presented the divestment case and provided more detail about the movement and how to launch a campus campaign. This was followed by a robust discussion. It looks like we may have a UFS campaign starting early next year. Go UFS! We hope you will be the second university campaign in SA. • The Green Times has another in-depth account of our Cape Town launch. • There’s so much international divestment news that it’s hard sometimes to know what to pass on, but very notable news is that students are now suing Harvard University to force it to divest – so far, the administration has refused to divest. The university’s arguments for refusing divestment – that it’s addressing climate change via research and teaching – ignore the extent to which the fossil fuel industry is actively blocking change. • Norway’s largest pension fund has divested. • This article from a Swarthmore student compellingly addresses the objection that we can’t pursue divestment while still reliant on fossil fuels ourselves. • Here’s an account of one of those sections of the US government that does take climate change incredibly seriously – the military. • ‘What It Would Really Take to Reverse Climate Change’ – thought-provoking article from former Google employees. • An article in New Scientist speculates about how our world might have developed in the absence of fossil fuels.